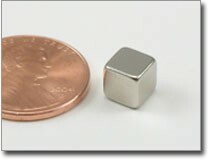 This small cube magnet is another good all purpose size. It is a shade less than 1/4" and can hold up to 3 lbs. The poles are on opposite sides of the cube.